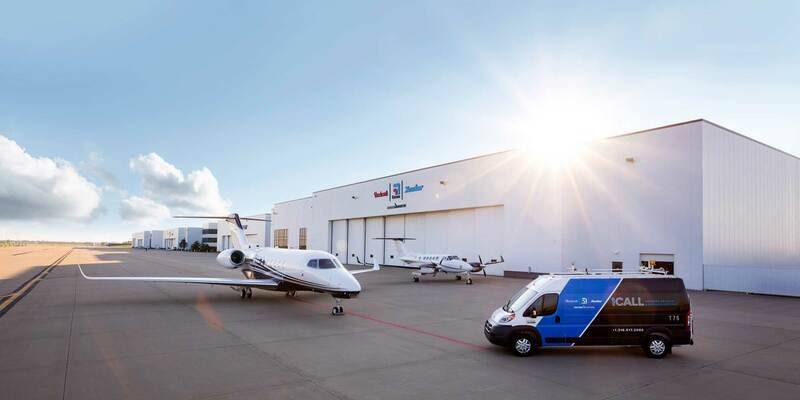 A dozen years ago, Cessna Aircraft launched its first mobile service unit (MSU) to provide emergency maintenance service to its Citation jet customers whose aircraft broke down away from their home base or a Citation service center. “We wanted to think about how we could bring service to them more effectively,” said Kriya Shortt, senior v-p of customer service for the Cessna brand’s parent, Textron Aviation. “It’s really the genesis for why we got into the business.” But over time, the role of MSUs has expanded. Since the 2007 launch of that first MSU in New York, Textron’s fleet of MSUs now numbers 70 in North America and five in Europe. That fleet is growing, on average, by about five new trucks a year, Shortt told AIN. But Shortt and executives of other OEMs and maintenance providers acknowledged a trend of operators and owners requesting MSUs for some scheduled maintenance activities such as tire changes, changing out main battery shipsets, or light inspections. It’s a trend that they expect to continue, if not grow, as advances in technology could make using MSUs for scheduled maintenance a fixture of their menu of services, one of the executives said. “I think that eventually, that is how the industry is going to evolve,” Mark Singer, director of mobile services for Signature TechnicAir, told AIN. “I think you’re going to see the mobile units not only be available to keep you mission-ready, keep your aircraft making revenue when it’s supposed to, but I think eventually you’re going to see even the manufacturers, and especially the people that are Part 135 that have the ability to write their own inspection programs, start to make very, very small inspections that are very specific,” added Singer. He joined TechnicAir in February 2018 to help launch its MSU business, which has operations in six U.S. cities and three UK airports. In 2019 it plans to add three more MSUs in Europe and another two in the U.S., he said. These MROs understand the desire of owners and operators to have scheduled maintenance performed where they are. It saves them the cost of a repositioning flight to a service center, including fuel and in some cases paying a contract crew to ferry the airplane as well as shouldering the costs of putting them up for a night or two in a hotel. “There’s a lot of costs to get an airplane moved to a location,” Randy Deal, TechnicAir’s business development and marketing director, told AIN. Ray Godon, director of Bombardier Business Aircraft’s customer response team, said the Canadian manufacturer of Learjet, Challenger, and Global business jets also includes scheduled maintenance with its Mobile Response Team (MRT) trucks, a service that it launched in March 2014 with the first truck based in the Chicago area. Bombardier now has 30 MRT trucks worldwide, with 19 of them located in the U.S.
“We’ve been on a very determined path to grow our services and support infrastructure in the past several years, and we’ll continue to explore opportunities to further expand and enhance our network,” Godon said.